Mr. Viraswami Pathar, was born on 28th March 1908 in Mappilaikuppam in Thanjavur District. He received his education from Government High school, thiruvarur and National High School Nagapattinam and took his B.A. Degree in Mathematics through Sri Meenakshi College Chidambaram. After serving for a few month as inspector of co-operative societies he joined duty as Deputy inspector of schools in his twentieth year. He took his L.T. degree one year later. He served for 35 year as deputy inspector of schools headmaster government Training school personal assistant to district government training school, personal assistant to district educational officer professor of English in government arts college Kumbakonam and government officer and retired on 20-3-1963. He also served as Block development officer in north arcot district for about one year: after retirement he worked in Seshasayee institute of technology, Thruchirapalli for five year and was on the staff Jamal Mohamed college, tiruchirapalli for 2 year since July 1968. He sponsored several new schemes in Education and earned all India recognition in regard to the scheme of one minute silence at the commencement of the day work in all school in Madurai and south arcot district the national savings scheme the mid-day meal scheme and school improvement conferences. As sub-warden of the Government college hostel Kumbakonam for four year he succeeded in running the institution as an Ashram in the setting of a student Republic. He was a member of the Madras Text Book Committee for nine years and served as Chairman of the committee set up for the revision of the syllabus in English for the primary course. In recognition of his meritorious service in the field of recruitment and welfare work during the second world war he was awarded a sanad Recruiting Badge and a welfare Medal and in recognition of his service in the cause of religion he was awarded the title of Bhakti sigamani at a function in Madras presided over by Mr. V.V. Giri Ex-President of India who was then governor of Kerala and the citation runs as follows. He was a devotee of a very high order and was held in great esteem and his services stand well recognized. He had brought out a valuable book in English on “Temple and its Significance” in 1974 and his third book “quintessence of Narayaneeyam” also Publisher later. He presided over the Non-Gazetted officer’s conference at vellore in 1955. He did a valuable service as president of the Tiruchirapalli district pensioner association Tiruchirapalli. He was interested in science music and astrology besides the comparative study of Religions. Vedas are the treasure mine of spiritual intuitions and seer visions. They are mantras of the real. 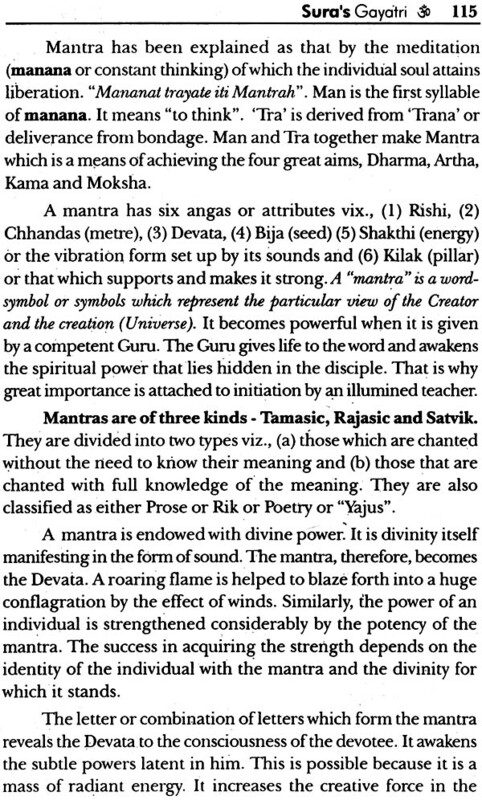 Mantras are protective force of those who chant them and gayatri is the mantra of mantrs. It saves the chanter (Gayantham Trayate). It is the epitome of Vedas and the keynote of their teachings. It is a unique mantra of purity unity and divinity. Gayatri Japam polarises the human entity and opens the mystic psychic centres and sets vibrating the cosmic energy latent in them. Intense repetition of Gayatri nourishes life with a transforming nectar. It is a routine repetition of high souled Hindu a power sadhana that has flown down the current of ages. 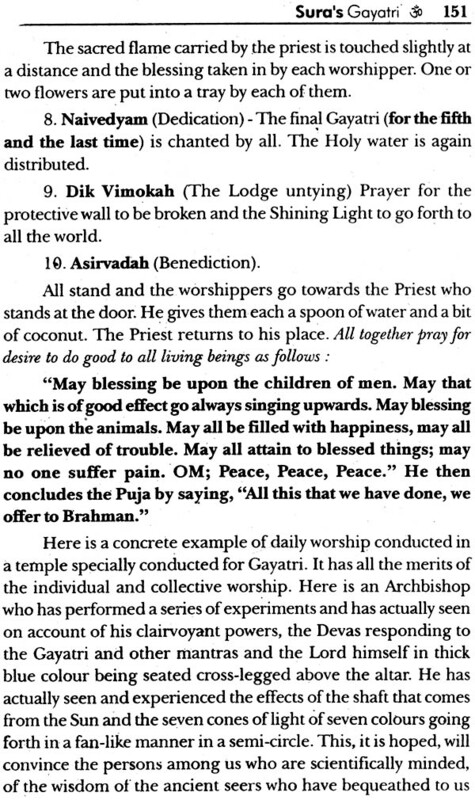 Gayatri accords sovereign power and a spiritual rebirth to ardent Sadhaks. It holds good to all Ashvamitas and all vedins. The Brahmacharin the Grahastha, the vanaprathan and the sanyasin followers or Rig, Yajur sama and Adharvana Vedas adore Gayatri and get the best of it. The culture and civilization of India were nourished by the Gayatri Yoga. India that lost this blessing lost its paradise. To receive glory. It is the elixir which can restore strength and rejuvenate the nerves. Gayatri is a mantra of the pure almighty grace which is the light and energy of the divine. It is the mantra of Shuddha Shakti AUM the bargos of savitri the consciousness force of the lord of light. The soul evolves towards divine Effulgence by doing the perfect Gayatri which consists of four feet along with the Vyahriti which is an efflorescence of AUM the unique symbol and form and name of God. Only the three feet are in vogue now. The fourth also must be uttered hence by devotees. Gayatri must be done by proper initiation. Initiation is given during Upanayanam by bringing the Brahmachrarin near in contact with a perfect Master. After uttering the Gayatri properly after sandhya 108 times morning and evening during dawn and dusk the pranayama Gayatri may be attempted and that can develop in the Antar pranayama Gayatri the technique of which has been described in my “Secrets of Yoga” (second Edition). 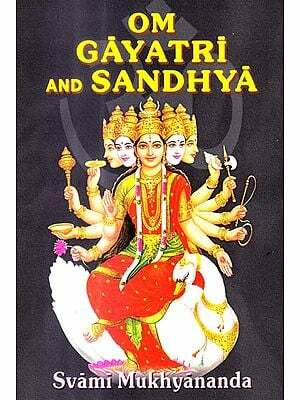 Gayatri has extensive meaning and significance. Book and books have been written in several languages. 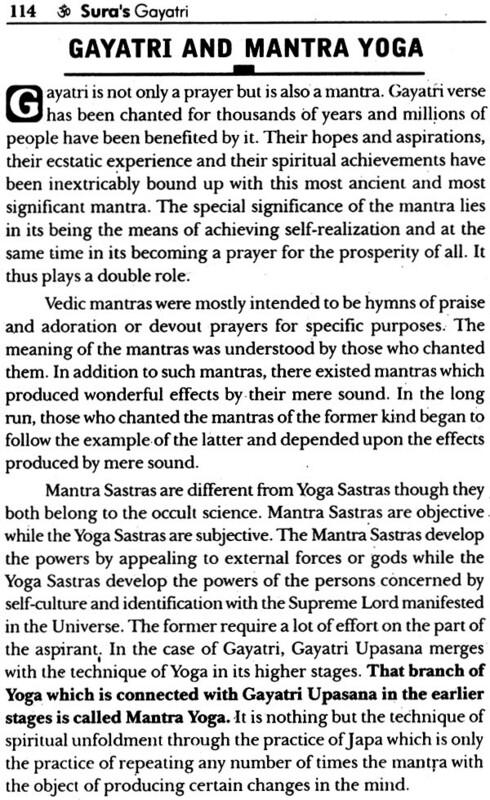 I was pleased to go through one book which contains in essence everything that has been said about the intrinsic glory of the Gayatri mantra and is sadhana and integral effect. It is the Gayatri Sadhana of Prof. S. Viraswami Pathar M.A., L.T., I went through the manuscript of this monumental contribution to the spiritual library and its style and substance made a deep impression upon me. Mr. Pathar has ransacked that whole spiritual library and mantra sastra and has presented his theme with earnest sincerity. He creates in the reader the fire of aspiration to continue the Gayatri Upasana and feel for himself the magnanimity of its vibrant dynamism. I have high regard for Prof. S. Viraswami Pathar whom I know intimately for the past quarter of a century. He is a self made genius a patient pilgrim soul mounting step by step to scholarly fame and literary eminence. He is a flower of modern education, breathing the fragrance of ancient spiritual lore. He is a successful savant who has done yeoman services to the student population as a professor and as an educational officer. I have often wondered at the way in which student obeyed him and listened to his lectures with rapt attention. He was in tune with their aspiration and they lived in tune with his will to give them a man making education. 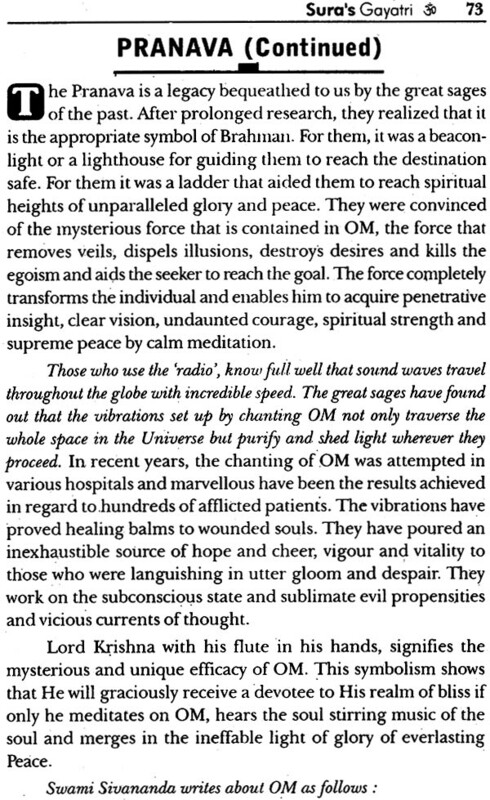 He unfolded not only the mental knowledge but also the spiritual stamina of the students under his charge. He is another Dr, Arnold amidst us. While his services to coming citizens of India still continue I admire his service to Hindu Dharma through this copious volume of Gayatri. He lives a clean family life and unites in him the four Purusharthas Dharma, Artha Kama and Moksha. He is qualified to write his magnum opus on Gayatri. I have been doing Antar Pranayama Gayatri from my boyhood initiated by Yogi Purnamanda. I have built a pranava Mandir and placed Gayati in its Sanctum in my Yoga Samaj at Adyat. I have experienced the conscious bliss of making my very breath. Gayatri Japam. Hence I recommends this excellent book of Proff. S. Viraswami Pathar to all aspirants East and west. Let the Mahamantra, Gayatri, accordus Ojas, Tejas, Varchas Spiritual effulgence divine bliss and pure energy and make us reborn in Gog Consciousness. Aum Jaye Aum, Aum Jyoti Aum! Prof. Viraswami pathar is a veteran educationist and versatile scholar with very deep piety as his very surname signifies He is man of view and strong convictions. Coming as he does in the classical line of educationists with a vision of Truth and a mission to fulfil like the celebrated Dr. Arnold of England and the sublime Gokhale of India Mr. Viraswami Pathar also is able “to see life steadily and see it whole”. Moulded in the mellowed pattern of the magnanimous teacher of old Mr. Pathar lives moves and has his being in the unpolluted and elevating atmosphere of academic aloofness and heights simple but self-respecting humble but straight as a stick smiling but serious in life scholarly but not showing off Mr. Pathar Spells the language that is sonorous cultured and serene. He always aims high and achieves the sky as indeed he has done in the present instant.. This is an historic era of daring ambitions and dangerous adventures contemporary man is ceaselessly contemplating the conquest of Nature and control over the creation. At one blow he has invalidated the old-time adage of “Crying for the moon” indicating “asking for the impossible or unattainable”. What the ancient Avatar of Rama had cried or in vain the modern man called Armstrong has achieved as a gain. What the strong arm of Sri Rama could not catch hold of i.e. the moon has now been captured and handled by the Armstrong of modern man. Science is striding the world like a giant Apolloing the sidereal system above like a colossus and adventuring into the oceanic depths like a whale and thus it is at once plying the tow fold role of scaling the heights and plumbing the depth of God (siva) even as Brahma and Vishmu had severally attempted before. Man has exchanged his old time pilgrimage of benares and Bhulbaneshwar for the new. Fangled Apollo flights to the moon and the mars. The very heaven which our ancient had dreamed of attaining after death is almost in the girp of our fellowmen in their very life time. Thus the kind of rivalry with God or the challenging of his undisputed supremacy by Satan or Beelzebub in the past, has now become the effective role of modern science. The monster of Frankenstein gropes about the modern universe in the mighty mask of modern science in ceaseless search of innocent victims straying around artificial insemination artificial transplantation of heart lungs and kidney are the scientific challenges to God. The sphere of divine control seems to be shrinking in size and diameter in proportion to the expansion of the size and enlargement of the suzerainty of science. But in this cut throat competition in this battle of ours and in this combat of capacity between God and Man the latter seems to be the more powerful. But the trump card in this game is still in God’s hands. The soul of man is still a mystery and elusive mercurial indefinable (Anirvachaniya) which is the ace still kept in the hands of God. “The soul of man is larger than the sky, deeper than ocean or the abysmal dark of the unfathomed centre”, says Hartley Coleridge. “A single soul is richer all the worlds,” says Alexander smith. And yet the greater the conquest of Nature by man is the smaller does his soul grow, in inverse ratio. This is the most grievous tragedy of mankind. What profited a man if he gains the whole world but world but loseth his soul asked Lord Jesus. And we are today just in this fix of a paradox. More tragic is the loss of soul in India. India’s soul has fallen on evil days; it had had the fall of foul Lucifer. It is not noble pure and selfless but it is also demoniac not only deadly and poisonous. Hence it knows no peace. And if mankind is to prosper and grow into a full blooded type of beauty health power and beatitude, it must conquer its own soul and discipline it pari passu with its conquest of and control over nature. There must be a simultaneous growth of Man’s inward soul and environment. The establishment of dominion of man over external Nature must be matched by his establishment of the kingdom of god in the internal soul. Then will dawn the golden age: then will man turn a new page in his chequered history of the past strewn with broken skulls and incarnadined by streams of blood. And India needs such a moral and spiritual regeneration nay resurrection and that immediately. Many a noble soul has attempted this in the pas the long line of revolutionaries ends with Vivekananda Gandhi and Vallalar but in vain. Our premature political emancipation has undone all the effects of their efforts in this spiritual regeneration. The inflation of currency and of each individual has alike demoralised money and man. But are we not going to call a halt to this Rake’s Progress now? He has been carrying on serious and series of researches into the Vedas Upanishads and other spiritual religious for a fairly long period. Plunging into those precious mines of perfections and peace our friend had dug out the most precious diamond called the Gayatri Mantram. It is at once the king of mantras and the queen of gems. It is the biggest and brightest gem of the priest ray serene. It is a veritable open sesame’ which will throw open to man the treasure cave of the most invaluable spiritual treasures. What the glorious hooded cobra is in the world of snakes what the majestic maned lion is in the world of animals what the magnanimous Mahatma Gandhi is among the humans what the Apollo 11 is among the all powerful space ship what St. Tiruvalluvar is among the teacher of the world what kamban is among the poets of the world what the mighty Banyan is among the marvellous world of trees what the riotous Ganga is in the world of mighty river and what Lord Siva is among the heavenly god that gayatri is among the glorious mantras the most supreme sublime spiritual special soul lifting softening and salvation yielding one among them. 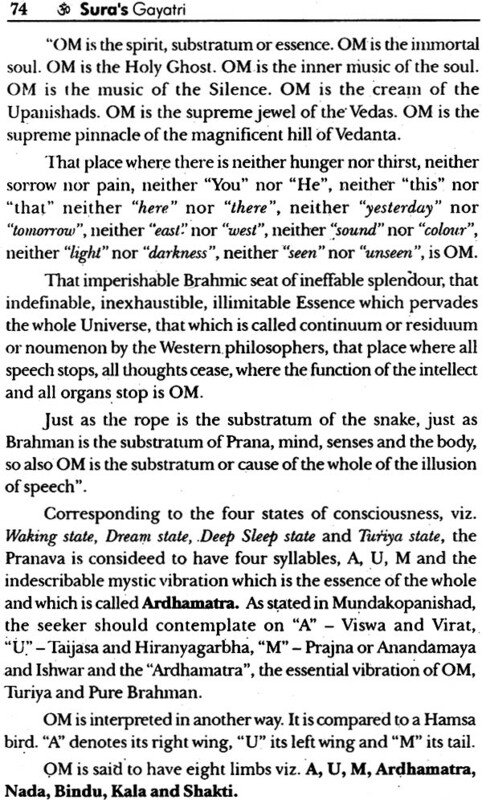 The Panchakshara is perhaps its only equal and we need not press its claim here. Both are of equal efficacy. Yet the Gayatri is the more poplar and democratic whose vibrations have been more broad based and universal. Mr. Pathar has written this erudite excellent scholarly many-faceted and highly interesting book on Gayatri and not merely as an author but also as a dedicated diffuser of divine light and a delightful purveyor of spiritual food for the hungry millions of this world in high tension. He has made a present of it to us so that we could by mean of this sanjeevi for the soul rejuvenate our mind resurrect our spirit and revitalise our lives. It is an amazing piece of ardent research worthy of an academician of the highest order and also worthy of an old time Rishi of our own land. This is exactly what Mr. Pathar is attempting to do through this extraordinarily stimulating book. And we must also use it as the Magna carta of mantirc freedom the very text and gospel for our five year plans of spiritual rebirth to be planned by us in the process of enabling Indian as a whole to attain peace and prosperity shanty and salvation in this world and next both individually and nationally. The universal adoption of this unrivalled gayatri of ineffable potency both secular and spiritual must be enforced among the Hindu in Particular and Indians in general. The work must start from the elementary school pupils of all sects and sexes. 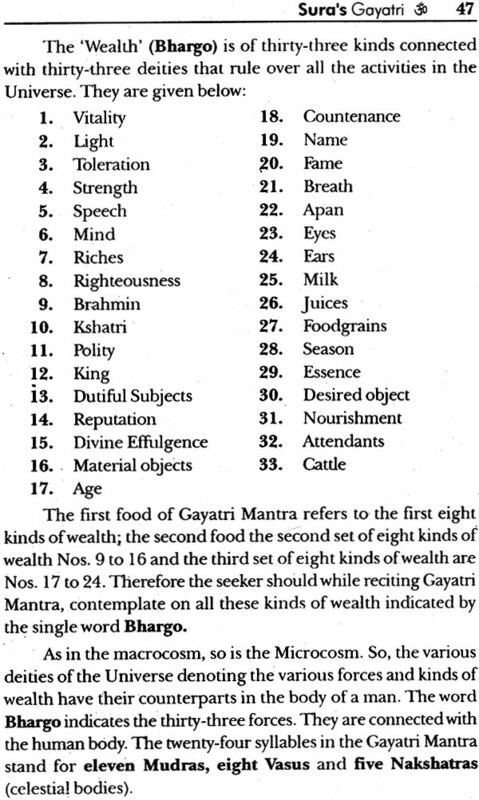 The Gayatri is and must be made the national Mantra of India. Just as the Asoka Chakra and the animals have become the our mighty national animal have become the national symbol of India, just as the magnificent lion has become our mighty national animal and just as the beautiful peacock has become our brilliant national bird so also should the Gayatri be adopted the national mantra of India! I regret my inability to expatiate any more upon this bold but beneficial scheme of soul-culture that is the most vital need of India to-day. A fiend in the US Ernest longest has shown me your work on the Gayatri Mantram in which I am interested and to which I have been drawn in the course of self-realization. The use of these cosmic sounds has done much of benefit for me and my surrounding your countryman Swami Krishnadott (Shringsi rishi) has indicated theuse of this mantram as a potential solution for the world pollution crisis. After trying in this capacity I concur. My friend Dr. Ishwar C. Sharma chairman department of philosophy Udaipur University has witnessed these results in our area of recent residence Hampton Newport news, Va, where he was visiting professor of philosophy at the local Christopher Newport college and I a local resident professional astrologer. For all the good result in balancing weather cycles etc. 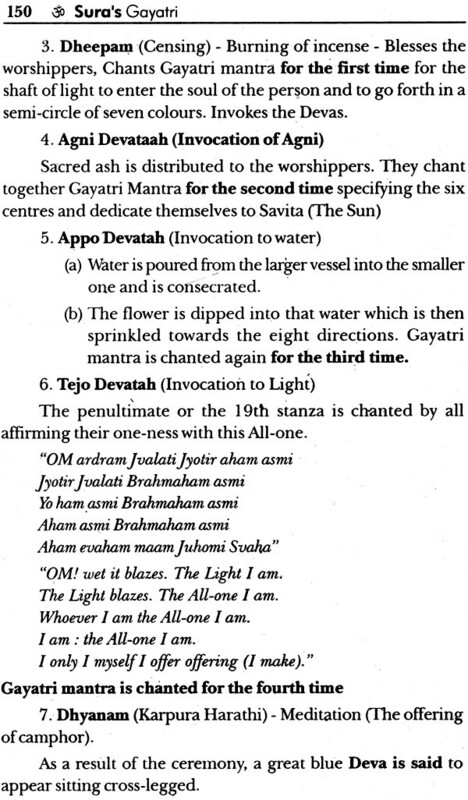 I think gayatri is more important as an aid to illumination. If inner pollution can be swept out by the energies contacted the outer world will at least locally have to follow suit. To this end I wish to study it in greater depth and wish to order one copy of your work on the Gayatri. I have set Gayatri to music chanting in the key E-flat since the body of the earth logos (Ganesha) has been found to vibrate in this key 20 octaves below middle C. This renders it more effective as I have found by comparison with the usual chant.